This is a question we are asked quite often. Medicare is NOT a full coverage health plan and was not intended to be. Both Advantage Plans and Medicare Supplement Plans were created to help reduce your medical costs and limit your exposure. After all, no one would want to be stuck paying 20% for the cost of chemotherapy or radiation! 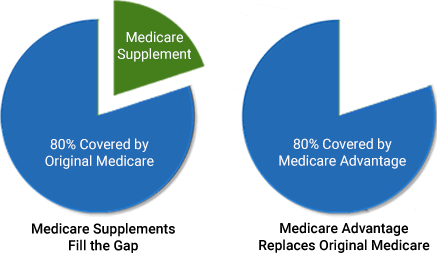 With a Medicare Supplement, your Medicare will remain primary which allows you access to Medicare’s network of physician’s and hospitals (95% of physicians are in-network with Medicare). You can see any provider that participates in Medicare, regardless of which supplement company you chose. You have access to all the Medicare providers nationwide – no referrals necessary! Medicare will pay your medical bill first and then your Supplement Insurance pays the remaining balance. Depending on which Supplement Plan you choose, you may have a small deductible or some cost sharing. Medicare nor the Supplemental plan cover prescription coverage so you might consider enrolling into a Part D (drug plan). Because these plans offer you the most freedom and flexibility, they have higher premiums than Medicare Advantage plans. Please contact us directly for quotes. Medicare Advantage Plans on the other hand, are entirely separate from Medicare. When you enroll into a Medicare Advantage plan, you get your benefits from the plan, not Medicare. You agree to use the plan’s network of providers except in emergencies. You’ll pay copays for your health care treatment as you go along. Think of these plans as an alternative to Original Medicare. Many Medicare Advantage Plans will cover Part D (drug coverage) as well. Be sure to check the plans formulary to make sure your drugs are covered. These plans usually have lower monthly premiums than Medicare Supplement plans. Some of these plans are even offered at a $0 monthly cost (depending on area). You will still be responsible to pay your Medicare Part B premium. There are fewer contracted doctors with Medicare Advantage Programs vs. Original Medicare so you will want to make sure your doctors are contracted with the Medicare Advantage Plan before enrolling. OOP quickly. Check the plan’s summary of benefits to find out what the OOP Maximum is on the plan you are considering. If paying the OOP would be financially draining then you might consider a Medicare Supplement since the payments and expenses are more predictable. I’ve had clients enrolled into a Medicare Advantage Plan contact me when they are seriously ill and ask to be switched to a Medicare Supplement Plan. Mostly because the specialist that they want to see is not contracted with their current Medicare Advantage Plan. Unfortunately, many times the client is not able to switch over to a Supplement Plan. The insurance carriers are able to decline due to health conditions. There is however a couple of exceptions that you would be allowed to switch from a Medicare Advantage Plan to a Medicare Supplement. There is a trial period for people who try Medicare Advantage for the first time. If you decide to dis-enroll from the plan and go back to Original Medicare within the first 12 months of Medicare Advantage coverage, then you can return to your Medigap plan with no underwriting. After the 12 months is up, then you are subject to underwriting. It’s important to compare the costs and benefits between each plan before enrolling. We know that choosing a plan that your doctors are contracted with and also checking drug formularies can be confusing and exhausting. That’s where we come in. We’ve helped enroll thousands of people like yourself choose the appropriate health plan. Were here to help you navigate through the plans, assist with the enrollment process and we will be here for the life of your policy!